The shaft geometry can be imported from 2D DXF or 3D STEP files. In case of a 3D-STEP file, the x-axis has to be the axis of the shaft and it has to be only one part in the file. An intersection of the part in the x/y-plane is done and the resulting edges are considered as in the DXF input. Relief grooves in the CAD model can lead to many imported elements. For the DXF file a normal drawing can be selected. By using the left mouse button, some geometry can be selected. The selected geometry can either be deleted or it can be cut. This allows to select the correct geometry for the import. The -button allows to switch through different layers within the DXF file. If an inner geometry should be imported too, the flag at the bottom of the window has to be activated. The DXF file only contains lines. Sometimes the software cannot detect the correct connections between these lines. In this case the wrongly used lines can be selected and deleted. 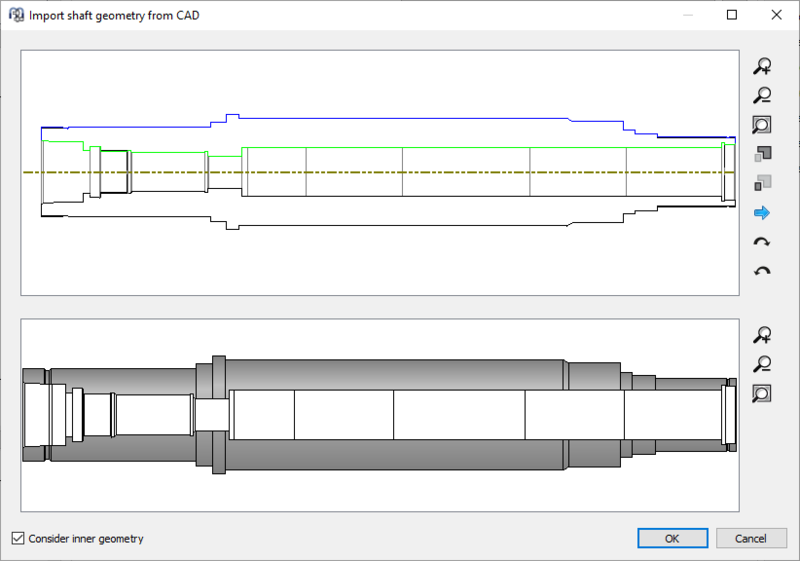 The lower part of the window shows the currently detected geometry input.